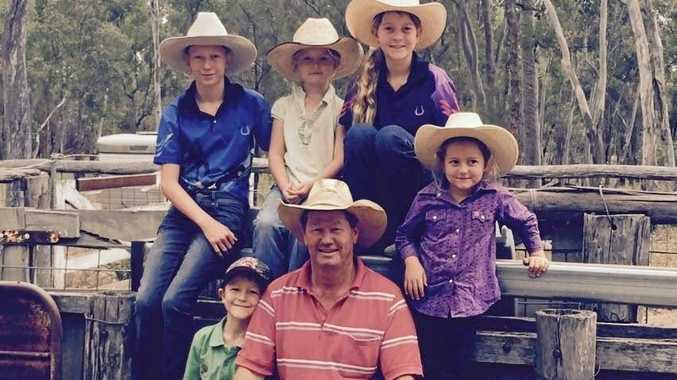 THE luxury of space is, for those of us who ferry a few kids around every day, much more valuable than a posh badge on the bonnet or a designer label cabin. Space is one of the main reasons that so many families buy SUVs. However, as we've pointed out here on several occasions, you don't have to join the SUV love-in to get a car with a big - or bigger - practical, versatile interior. 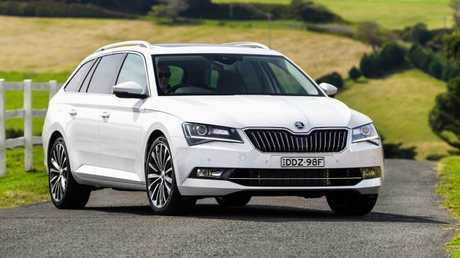 Skoda's Superb wagon has more occupant and load space than all but a few monster-sized SUVs. Its cargo bay, for example, is 660L in five- seater mode and a massive 1950L with the back seats folded. BMW's biggest SUV, the X5, holds 650L/1870L. Yet the lightest X5 variant weighs in at 1930kg - par for a family-size SUV - and the Skoda 162TSi, which we're testing today, is a featherlight 1490kg. 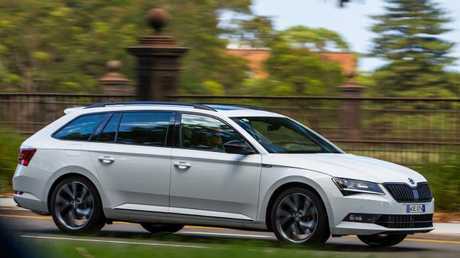 Clever and nearly unrivalled: Superb wagon matches the people-and-package space of all but the monster SUVs. The Superb wagon combines the space of a big SUV with the efficient, responsive driving characteristic of a car. Clever - and unusual, because, apart from Ford's Mondeo wagon, there's nothing else quite like it at the money. The Superb 162TSi, so called because it runs a 162kW 2.0-litre four-cylinder turbo - the same unit, minus 7kW, fitted to parent brand VW's Golf GTi - is $42,390. Drive goes to the front wheels, via a six-speed dual-clutch (DSG) transmission. Typical of Skoda is a wish list of intelligent ideas that make life easy, safe and enjoyable for parents and kids: three-zone aircon, with temperature controls for the back seat; rear side window sunblinds; four bag hooks, removable torch and multi-position load cover in the boot; three 12V sockets; power tailgate; chilled centre console and gloveboxes; fast glass for all side windows; centre console and rear seat tablet holders; rubbish bag holder in the door bin; and even a brolly in each front door. The Superb also has efficient, intuitive touchscreen infotainment, with a 9.2-inch glass screen, bright, hi-res graphics, sophisticated voice control, navigation, a couple of SD card slots, seamless Bluetooth (with text messaging but not email), Apple CarPlay and Android Auto. Superb cockpit: Intelligent features, up-to-date infotainment — even a CD player. Old farts who can't get a handle on all this newfangled tech even get a CD player. Also standard are Alcantara leather-faced seat upholstery, a leather-wrapped steering wheel and gear lever plus heated front seats with power adjustment and three memories. You sit quite deep within the Superb, on a firm, supportive cushion with long travel, heating and a lightly bolstered backrest with power lumbar adjustment. Optional adjustable suspension (part of the $4200 Tech Pack, which also includes driving mode selection and automatic parking) provides a luxurious, absorbent ride around town in Comfort and Normal modes and a firmer, though still exceptionally smooth, quiet and controlled ride in Sport mode on the open road. It's a limo in the back seat, with unlimited legroom, a high, firm bench and enough space for two adults to really stretch out and relax, or three to stay friends. No options required, with standard automatic emergency braking, blind spot monitoring, lane keeping, adaptive cruise control - and a combination of these technologies delivering semi-autonomous capability below 60km/h - plus rear cross traffic alert. Emergency assist will sound a warning and initiate a short swerve to get your attention, then ultimately stop the car if it senses you're no longer in control. The Golf's 2.0-litre is an energetic, efficient device that does the job well enough in the Superb. A claimed 0-100km/h time of 7.1 seconds is respectable and credible. Absent, though, is that immediate, off-idle boost of more utilitarian turbo engines; the GTi version needs 2000rpm on board to pull with purpose. With the six-speed dual-clutch transmission's characteristic hesitation when moving off from rest, it can leave you marooned for a moment or two in traffic when you want immediate go-forward. Once rolling, the shifts are crisp, timely and smooth. It also helps the Superb achieve stingy fuel numbers: 5.5L-6.5L/100km on the highway and, in Eco mode, with the smooth, unobtrusive stop-start helping the cause, 8L-10L/100km in town. No comparably sized petrol SUV will get close to that, simply because the Skoda is so much lighter. Any engineer will tell you that weight is the enemy of performance and efficiency. 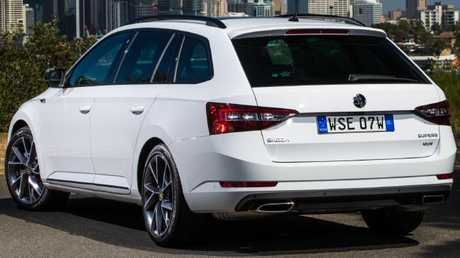 On a roll: Superb wagon shares its engine with the VW Golf GTI, slightly detuned. The Superb doesn't feel heavy on the road either, though in Normal mode the suspension lacks control over body movement, so there's some roll and float at highway speeds, like an old school big car. Sport mode tightens things up nicely, though this is most definitely not a sporty machine. I hate SUVs and I want to advertise the fact. Before they went broke, I would have bought a Saab. Skoda has a similarly thoughtful, alternative vibe. Like me. I can tick the luxury/tech options boxes and still get this on the road, absolutely loaded, for a nick under $50,000. No comparably sized SUV comes close at that price. Comparable in size to Superb but poverty pack specification. Runs a 149kW 2.0-turbo/six-speed auto. The 132kW (and 400Nm) 2.0 turbo diesel Trend, at $42,840, has more safety tech and fruit, so it's the pick of the range. Aggressive opening prices on Holden's new Euro import, with a 191kW 2.0-litre turbo/nine-speed auto. Not as big as the Skoda or Ford but well-equipped, safe and with local suspension tuning. 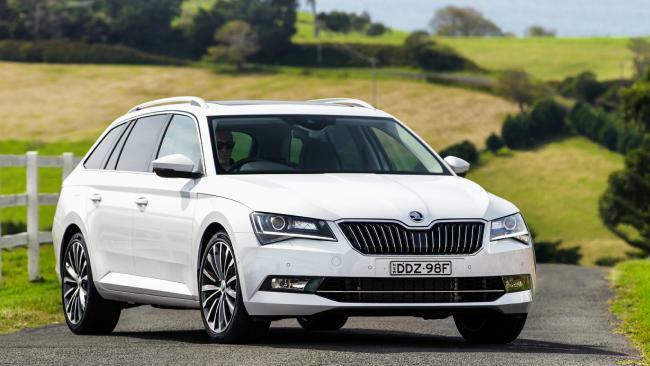 Great value for a big, efficient, practical, safe, luxurious, well-equipped family wagon. Why buy an SUV and drag an extra half a tonne of useless, expensive metal around?